Most builders understand this serious issue and first seek to create an open unobstructed cavity behind the brick veneer. A cavity aids in drainage and creates an opportunity for air to flow through. This would help keep the the brick veneer wall dry. 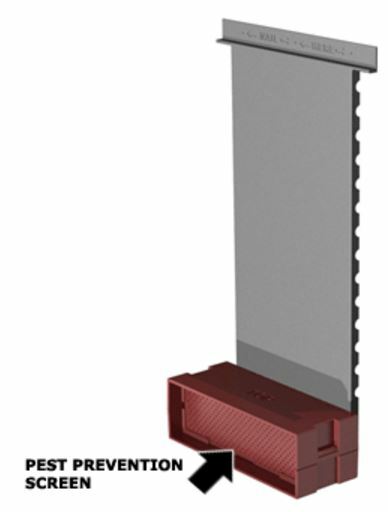 But weep hole inserts can easily become clogged by mortar during construction and their small size limits how much air can enter the cavity wall. 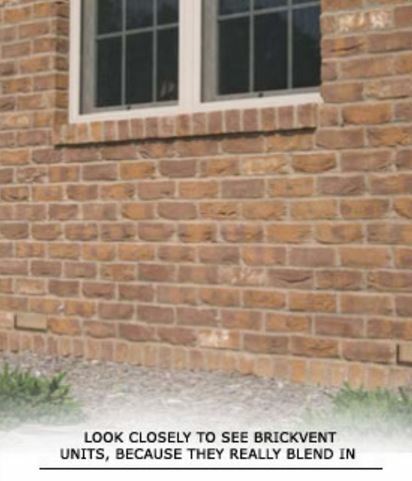 Now, BrickVent accomplishes and goes beyond the intent of building codes by providing ample drainage AND a much larger conduit for the flow of air to help keep the brick structure dry. BrickVent works by laying a series of plastic brick vents in place of the bricks along the bottom of the brick wall. The plastic vents are embedded with UV inhibitors to keep them from breaking down or fading. The brick vents are connected to a plastic mortar deflector that keeps the units from becoming clogged by falling mortar as the wall is built. After the brick wall is complete, there is an unobstructed path for water to escape and ventilating air to enter the cavity behind the wall. At clean-up, the mason will remove the protective cardboard insert and the brick vents blend seamlessly with the rest of the wall! because I was searching for thoughts on this matter last Saturday. Glad we could be of help to You Marquita! I’mplanning tto start my own blog ssoon but I’m having a difficult time making a decision between BlogEngine/Wordpress/B2evolution and Drupal. different then most blogs and I’m loking for something completely unique. Platform is WordPress. Good luck! What would you suggest if a house was built in 1954 with no weep holes? I do have moisture problems and am looking for an affordable way to rectify the situation. 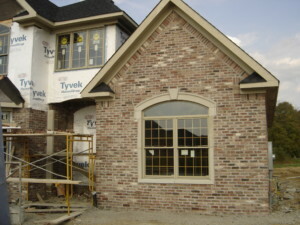 If the moisture is coming through the brick, then waterproofing the brick along with adding BrickVents to help keep the interior of the brick dry should be very helpful. Thanks for the comment Julie. All the weep holes in my house had plastic plugs placed in them prior to rendering and we’re never removed by the builder, is this going to be an issue? Typically the weep holes are meant to be open to allow for the weeping (and a tiny bit of ventilation :). However, there is no real way for us to know whether leaving the plugs in your weep holes will “be an issue”. You didn’t say how long ago your house was built, but keep an eye out for moisture problems (and you also may be able to smell if there is a problem). Weep holes allow moisture to drain out of of the space behind the brick. They also allow rising water to enter the space and hence the house which has happened to me on two occasions. Any suggestions? Hi Terrance. Thanks for the good question. Our guess is that you occasionally get excessive standing or running water that is the problem. So, if water is getting into the house through the weep holes and you want to stop that from happening, first check that the ground, landscape mulch, etc. is graded in a slope away from the house. If that seems to be okay, then plugging the weep holes is the next obvious suggestion. 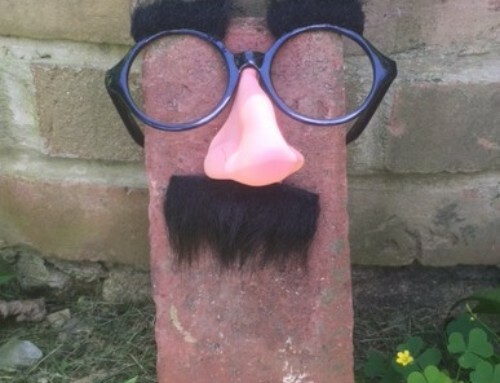 If you do plug the weep holes, then you have the issue of how to address the moisture that naturally penetrates the brick and enters the space behind the brick. Assuming that your house is not drafty, our suggestion would be to consider getting some airflow through the space to vent the moisture out. If you decide to go with BrickVents, then install them as low as you can, but not as low as your current weep holes (or you would be re-creating your current challenge with water entry). Remember that you may want to install one low and one high – at regular intervals – to facilitate the air draw through the space. 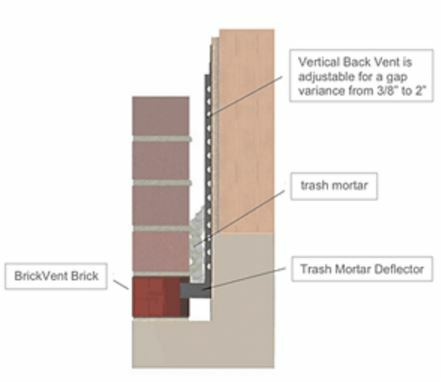 Besides allowing the airflow, it is worth noting that the BrickVents are drafted in a way that the inside bottom edge slopes toward the front of the brick so that gravity and the slope work in your favor to keep moisture from penetrating. Let us know how it works out, Terrance. I live in Houston, Texas where it’s very hot and humid and my house received 3′ of water from Hurricane Harvey. You should know that 25 years ago my home was leveled onto piers prior to our purchase and I have discovered since there is an 8″ to 10″ void between the slab and the earth beneath it (not caused by Harvey). Further, it appears that weep holes were never installed and we have none. After ample rains, the water leaches to the void space under the slab causing our floors to sweat until the under-slab mud dries. I intend to create weep holes, but believe they, by themselves, will be inadequate to dry the void area. My thought is to shape vent boxes around 6′ x 6″ (2 on each side of house) with a vent pipe extension which would install through the soil that is against the house foundation and protrude into the voided area. In this approach, the above-ground box or pipe would be equipped with a rain cape and insect screen. I’m interested to hear your thoughts on this idea and/or other solutions you may be aware and offer. We have to put the disclaimer on the front-end that since we are not seeing your application in person, all we can do is give you our thoughts based on your description. We can’t be liable in these kinds of situations – only a sounding board of sorts… like talking things through with a neighbor. 🙂 Keep in mind that you may want to contract a bonded professional in your area to get hands-on into all of this. Now, regarding your challenge. Ideally you’d get drainage from the area, but drainage would also allow for more water to enter – even without a Hurricane Harvey when you have ground saturation. So that’s out. Therefore, It sounds like you are on the right track, because it seems that the next best thing would be to allow for some air flow and venting of the space. In that your space is horizontal under the slab, it will be tougher to create a draw of air, but vents are the starting point. You didn’t say whether your lowest course of brick is above grade (i.e. above the dirt/ground on the exterior) and whether the 8″-10″ void space under the slab would also be above grade and/or behind the brick facade. If the void space is above grade, just behind the brick, then something like the BrickVents appropriately spaced around the exterior of the house would allow for moisture to weep, but – more importantly – for air to flow. To assist the “cross-breeze”, having a high vent on the exterior wall should assist in creating a draw of air through the void space. Check your local code for weep spacing. The national code is installing weeps every 33″ linear. That is why we typically recommend that every other weep be a BrickVent (i.e. every 66″ or so, because it will weep as well). Then you can use weep inserts in between to ensure that you are not getting insects and such entering through the weep hole. Let us know your thoughts and if that helps.